As an autistic autism professional, my work has involved a very large number of different groups and settings. I have had the honour of working with the Houses of Parliament, Teachers, Psychologists, Psychiatrists, Social Workers and therapists of all kinds. In each setting, we work collaboratively, respecting one another as fellow professionals and trainers. I and my team are asked to advise on a wide variety of scenarios and situations, whether it involves children, young people, young adults or adults of other ages. We assess care home settings, train fellow professionals on the modern understanding of autism, and act as consultants. It's fantastic work, and brings me into contact with many hundreds of autistic people. Researchers, fellow professionals, parents, employers and employees, and a huge range of others working from home or not currently working. I have done this for 20 years now, part time, including being a Trustee of an autism charity, a Governor in an autism-specific school and Vice Chair of Governors with responsibility for SEND in a large and very mixed Primary School setting for many years, where our young autistic people thrived. I am also Managing Director of a Professional Practice covering most of the country and handling vast amounts of money and responsibility, as well as employing a team. There has been only one group of people who have generally refused to engage with me. Specialists in Applied Behaviour Analysis ("ABA"). I will say from the outset that there have been two exceptions to this, over the last years. Two individuals who were respectful, thoughtful and valued my input. I shall not name names or organisations in what follows, because those are not important. What is important is the pattern of it, for me as a professional. These are just some examples. Situation 1: Working in an ABA specialist charity for two years. We were expected to cope with the sensory environment. My fellow autistic professionals were sometimes rendered so ill by it that they had to go home. The leader of the charity would not speak to me. They stated that in their view, there was no need to consult with autistic people, as it took too long. We would be taken to events where the sensory environment was terrible, the format was unknown, and an autistic person would be paraded at the front as a 'zoo exhibit', told to say nice things about the charity. Then we would all applaud them. No-one would speak to the other autistic people - we were irrelevant. I took another fellow professional along. Also autistic. They were utterly ignored. Situation 2. Working in a formal advisory group for six years, at a high level. I was Vice Chair of that, brought in to provide specialist autism advice. In it, representatives from an ABA charity. I can safely say that in those six years, they did not speak to me even once, let alone ask my advice on anything. This is quite an achievement. Situation 3. A powerful ABA-supporting parent, in charge of allowing access to buildings for me. They made sure I was disadvantaged, time after time. My access was taken away and I was made to go through the most extraordinary procedures that I simply could not access. Meantime, the meetings in that building were filled with ABA supporters, and the senior figures would be sent endless letters from ABA supporter parents, telling them that ABA was the only way for autistic children. That it should be in every school. Every setting. That the children would be unable to function with it. I know this to be untrue. It is simply nonsense. Some children may benefit from some aspects of ABA, but ABA for autism is something that many professionals are deeply concerned about. There are many ways to teach a child good skills. Situation 4. ABA charities online. I would attempt to engage with them, politely and respectfully, asking questions about their work. I would be blocked on their social media. Repeatedly. None of their parents and teams were allowed to hear from me. They also blocked other fellow autistic enquirers, asking equally polite questions. Situation 5. An anecdote from a fellow autistic professional, who had two ABA trainers in their training session. The ABA trainers undermined the training session repeatedly, and were entirely dismissive of the autistic professional. Situation 6. The training materials. I got the industry-standard ABA training materials. Endless pages of how to control autistic people. One brief mention of sensory needs, in passing. A rather alarming example? Paraphrased - " We asked the parents what they wanted their child to be like. They said they wanted their child to go to parties like the other children. We explained that yes, we can deliver that for them, no problem at all." I've watched training happening in real life. I've watched videos of it. I've watched YouTube about it. I have spent two years trying to understand why ABA is seen as a good thing. Nope. Situation 7. I went into a care home, to do an assessment, as an autism professional. An ABA trainer was there. They undermined me, spoke over me, and barged into the discussion on every solution and every suggestion, to say their way was the only way. They even had business cards to hand to people to say they were the only person to be contacted. My fellow professional confided in me that they had tried ABA with some of their people, and it had been a disaster. Situation 8. A fellow professional confided in me that they were hired by an ABA charity to lie to the parents. If they were worried that their child was responding badly, and wanted to remove them, they were told to tell the parents it would damage the child. Even though that was a lie. I have no direct proof of this, but the person had no reason to lie to me. They also note that the charity hired zero autistic trainers or managers. Everything was done by non-autistic people. Offers to assist with those functions, from autistic people, were turned down. Autistic people were allowed to be volunteers, nothing more. Situation 9. I and fellow autistic people have been asking online whether there are some happy ex-ABA-adults who can tell us what's good about it. Silence. Nothing. Well, apart from the ones who are under an Ambassador contract with the charities. Situation 10. I went to a consultation event. There, an autistic adult who had been put through ABA. We chatted. All through the chat, he was making direct eye contact with me, with no clue what it meant, and attempting to smile throughout...which was a problem, because he was actually really sad and was crying. His life had fallen apart once he got to university, he said. ABA hadn't given him the skills he needed for real life. He knew to stare and smile, and wear a business suit, and say Polite Professional Things - but his quality of life, as an person, was now so bad that he couldn't cope. He couldn't be 'non-autistic' any more. I'd like to put in some positive examples now, but I've not been able to find any from autistic specialists or adults. ABA practitioners don't want autistic professionals within a mile of them, it seems. People ask me whether I like ABA. I do not. I have attempted to give it 'the benefit of the doubt', but frankly, as an industry, it is the exact opposite of being respectful of autistic individuals. It worries me tremendously that an industry that alleges to want to teach autistic children to speak then seems to spend its time silencing ,or refusing to hear, the autistic adults. The two exceptions have been a blessing. They are nice people, genuinely trying to offer something to autism. I am sure there are more nice people out there. It's not about individuals. It's about whether this is a respectful, responsible approach, given that there are so many other methods available that seem to be more respectful. I have too many questions that need answering about the methods used. We are starting to see research happening, showing that ABA may be causing harm to some. A recent paper by Henny around possible links to PTSD, for example. It is an emerging set of concerns, and clearly more work needs to happen around this. I, and many others, look forward to clarification on the short, medium and long term outcomes. Children need to be safe and have a good future, allowing them to flourish. In terms of their own agency, their confidence, their sense of being able to solve problems and learn skills collaboratively. In terms of their moral and spiritual awareness. In terms of their intellectual curiosity and opportunity. In terms of being able to say 'no' to things that cause pain and fear, unless there are really good medical reasons for those. In terms of seeing really good adult role models and having that opportunity to challenge, to think for themselves. Are they enabling all of this, with ABA? A serious, open question. 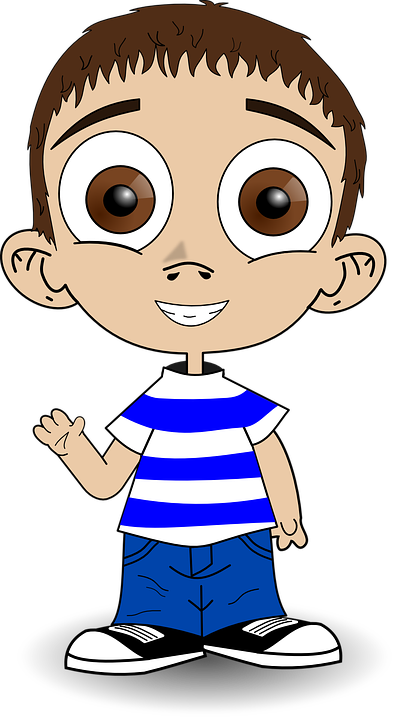 The picture shows a young boy with dark hair, wearing a blue and white striped top and blue trousers. He is staring and smiling, but it looks false. Autistic autism professional. National and international speaker.